This article was written by our CRM guru Ben. It's long-form and old school, but all the better for it: it captures the essence of why Student CRM appeals today. If you are looking to replace your current student recruitment and marketing solution, you will be aware it can be a little daunting and challenging. You will be nervous about making a mistake and buying the wrong system, be concerned about the amount of time and resource it takes to implement and be thinking "what if it all goes wrong?". We have this conversation on a weekly basis. You want to minimise risk, maximise your ROI and ensure you don't have an awkward conversation with the purse holder as to why you are now stuck in a long contract with a system that doesn't help you attract, engage and recruit students. Below are a couple of the conversation topics we discuss with Universities in the early stages who are looking to procure a new solution and how we think Student CRM helps. Hopefully, it will address some of the concerns you have, answer some of your questions, and help remove that fear of buying the wrong solution. We'd love to chat with you over a coffee about Student CRM. After all, we (and the many Universities who are using it right now) think it's pretty darn good. However, if you just want a chat about the CRM world, what we think is happening in student recruitment and what the future looks like, get in touch. We'll provide the knowledge, you provide the coffee (and biscuits). 1 - Platform or Solution? Student CRM is a solution: built, tested and already being used by dozens of UK universities right now. This means it's ready to go. The other option is a platform which will usually require you to "build" onto it and tailor it to your needs. Our customers have chosen to go down the Solution route as they don't want ongoing costs, the resource drain needed to support a large platform system and the man-hours needed to tailor it to their requirements. They just want something that works, does the job they need it to do and they know they have a system that is built for the exact job they need. 2 - Fit for purpose? Let's be honest, recruiting students is pretty up there when it comes to important things for a University to get right. We have seen this is an increasingly competitive sector with its own unique challenges, so why would you risk getting a system that wasn't built for the job? Student CRM is built specifically for the UK HE sector. We are based here in the UK (in sometimes sunny Dorset). Our Customer Support and Technical Support team are based here, in the same office (believe it or not, our technical support team aren't even in the basement underneath the office with no natural light, they are on the same floor as us!). We have worked in this sector for over a decade and we think we have a pretty good understanding of what our clients want. We only work with UK Universities and other UK based HEIs. Why don't we work with Universities in America for example? Well, how can we say we are experts in our field, or understand what our customers want, or be proud of the service levels we give our customers when we are thousands of miles away in a different country? How can we give the very best service and technical support if our staff don't even work the same hours as our customers? We can't! So we have ensured that we become experts in the UK HE sector and provide our customers with a solution that has been built with them in mind. 3 - Enterprise-wide or recruitment specific? Sometimes we speak to customers who aren't yet sure what they're looking for. Would a single system that covers all possible areas of the student journey from recruitment through to accommodation and finance be better than one that focuses on the recruitment side and talks to other "in-life" systems? We provide the latter here. Student CRM concentrates on the first point of contact through to enrolment and then we pick up again at alumni. We integrate with other solutions such as your Student Records System to cover the entire student journey. Why have we chosen this way? We know student recruitment like the back of our hand and want to provide a "best of breed" solution that talks to other "best of breed" solutions to provide the user and student with the best experience possible (that was a lot of "bests" in one sentence!). The thought of a customer putting all of their eggs in one basket and using (and funding) a system that was just "okay" in all areas didn't seem like a good outcome for our customers. A simple way of putting this: in football, the striker doesn't take the goal kicks, doesn't take all the throw-ins, doesn't go in goal to save the penalties, doesn't manage the team from the sideline... they do what they do best, score goals. They work seamlessly with their teammates who have the perfect skills for other positions to help win the game but stick with what they are good at. 4 - What's the future look like? This is coming up time and time again when we speak to customers who are looking to move away from their current system, often because it has become clunky, stale and hasn't changed with the times. How do you know if the solution provider will keep enhancing the system and add new functionality that will help you? Firstly, this shows the importance of knowing the sector and knowing your customers. We know the sector really well. But we aren't working at student recruitment fairs. We don't speak to international agents on a daily basis. We don't send out campaigns to students every week. So how can we provide our users with a solution that not only meets their requirements but removes their pains both now and in the future? We speak to them (remember that old school thing called speaking to each other?)! Our customers have created a User Group who meet every other month to discuss best practice, share feedback and tell us what they want to see in the solution. This means not only can we give our users a system that is fit for purpose, but we can also confidently say it meets our user's needs and removes their pains as they have told us what would help them do their job. These suggestions then get put into the Roadmap and our customers vote on what functionality or enhancements they want to happen first. A simple activity that is so powerful. Why would you want a solution that firstly wasn't created for the sector you are working in, but secondly is guessing what functionality you want (probably from another country)? Hopefully, you find the above helpful and it has been thought-provoking. What I lack in content writing, Student CRM more than makes up for in student recruitment and marketing! We'd love to chat to you and discuss your pains with student recruitment. We can then show where we can help you meet your targets, and you can be the toast of your team for being the person who introduced them to Student CRM. Get in touch now on 01202 237406. What have you got to lose? Open days are hectic. So much planning, organising and arranging goes on months in advance that it's easy to lose track of something vital. With Student CRM you have the tools necessary to make sure nothing gets missed. So you can take it easy, knowing your Open Day is under control. Take a breath. Smile. With Student CRM your Open Day is under control. Everyone has their own needs and wants, and no two students will ever have exactly the same requirements. With Student CRM you have the tools to converse with, and learn about your students. When you know what your students want, helping them and applying your expertise is easier. Some students have questions about everything from university life, to their chosen course. This student knows exactly what to ask to get where she’s going. Student CRM gives you the tools to answer quickly, efficiently, and as fully as she needs. For a student at the start of their journey, anything is possible. But they can’t go anywhere without the right information. Student CRM helps you deliver that knowledge so your students are on the right foot from the get-go. Everyone approaches things in their own style, but sometimes we can mistake that style for something else. The student who seems too controversial may be the student who’s asking the hard questions. The student who’s ‘too brash’ is trying to get to the heart of the matter. The student who’s seen as unconventional is looking for new solutions to old problems. These are tomorrow’s movers and shakers. When you meet them, you’ll want to recruit them swiftly. With Student CRM you have the tools to do just that. Automated welcome emails sent out? Check. Student Ambassadors trained with the booking-in app? Check. SMS primed in case of emergency? Check. Looking forward to your best open day ever? Check! There’s no denying that open days are hectic, but with Student CRM you have the tools to manage your event with confidence and ease. Did you know Student CRM has more communication channels than any other student recruitment CRM? Besides the standard email touchpoint, Student CRM helps you communicate via three extra methods. Use SMS messages to send information to students on the go, or generate labels for invitation postcards. Letters can add an air of personalisation to prospectuses, or provide Open Day information for passing to parents. The best part is all this is controlled by you. You have control over how your touchpoints look, when they'll send, and if you want to focus on who receives them. Unlimited creation and "draft" status means that you can duplicate and test to your heart's content, with no fear of accidentally sending something you shouldn't. If this sounds like something you'd like to be able to do, book a demo today. Event Day Scanner is a powerful new app that helps take away the stress of registering visitors to your university’s events. Gone are the days of struggling with sheaves of paper, gremlin-infested handheld barcode scanners, or other clunky methods. Instead, this simple app works on smartphones and tablets, on iOS and Android, to quickly and easily get your attendees registered and marked as attending in Student CRM. Now your student ambassadors can use their own smartphones to securely scan thousands of visitors’ barcodes, right across the campus. All registrants get instantly synced into the Cloud to give you real-time reporting throughout the day. “Your university’s student ambassadors can now quickly scan visitors’ barcodes to register attendance using nothing more than an ordinary smartphone or tablet, eliminating any need for special hand-held scanners or software. This finally fixes the long-standing pain of fighting gremlins seemingly built into every third-party handheld barcode scanner we have ever recommended to our users. With Event Day Scanner you’ve one less thing to worry about. Discover more ways Student CRM can make your recruitment easier. It’s no secret that behind many a great invention is a group of fans, driving it forwards. Student recruitment software isn't something you'd think of as having fans, but we can assure you they're out there. Spread throughout the UK's universities are a group of passionate folks who've invested time and energy to help Student CRM be the success it is today. Student CRM’s User Group is that collection of vested folk, made up of universities' student recruitment professionals. Meeting bi-monthly, at a different host university each time, the User Group gathers to discuss a myriad of topics related to their use of Student CRM. From debating new features intended to benefit all users of the system, to sharing best-practice tips and tricks with new members, the User Group focuses on helping make Student CRM better for everyone. Tired of being ignored by your current student recruitment software vendors? Interested in meeting the members of our User Group? The first World Access to Higher Education Day (WAHED) is on the 28th November 2018. The aim of WAHED is to create a platform which raises global awareness around inequalities in access to higher education and act as a catalyst for international, regional and local action. In the era of the 4th industrial revolution access to skills and knowledge has never been more important, but in every country in the world where we have evidence (over 90%) inequalities in access by social background exist. The initiative is being led by the National Education Opportunities Network (NEON) in the UK which is a non-profit organisation leading on equitable access to HE work in the UK. For further background on WAHED and the organisations that are supporting the initiative please go to www.worldaccesshe.com. It is supported by a planning group of organisations from across the world and by NCUK. UNESCO SDG 4: ‘equal access for all women and men to affordable and quality technical, vocational and higher education’ is a goal that student CRM continues to support through enabling UK universities to extend their reach to include a broader spectrum of individuals wanting to access higher education. World Access to Higher Education Day is an initiative led by the National Education Opportunities Network (NEON) in the UK and supported by NCUK. Each of the 17 global goals at https://www.globalgoals.org/ has the power to change the way we live. Here at Student CRM, we have chosen to help build a better future for everyone by joining organisations from around the world and working towards a better world by 2030. Goal 4: Quality Education is one of the 17 goals of non-profit organisation from the UK 'The Global Goals'. These goals were agreed by 193 countries on 25 September 2015, ranging from Poverty (Goal 1) and Global Hunger (Goal 2) to Affordable and Clean Energies (Goal 7) and Peace, Justice and Strong Institutions (Goal 16). "Education liberates the intellect, unlocks the imagination and is fundamental for self-respect. It is the key to prosperity and opens a world of opportunities, making it possible for each of us to contribute to a progressive, healthy society. Learning benefits every human being and should be available to all." It's shown through this statement that access to Education is believed to be a crucial aspect to the mission of 'The Global Goals, which is to 'to end poverty, fight inequality and stop climate change' and to create 'a better world by 2030'. If you think that Gen Z appear ambivalent about their PII (personally identifiable information) - don't be fooled by these digital natives. They entrust you with their PII throughout their student recruitment journey, so if you put one foot wrong all that hard-earned trust could evaporate in a heartbeat. Student trust is earned by helping each student understand how and why you are putting their interests first. These data subjects are in control. An uncomfortable reality perhaps, but for those UK universities who are embracing GDPR as a new opportunity to build trust and gain a competitive advantage, this is an exciting journey. 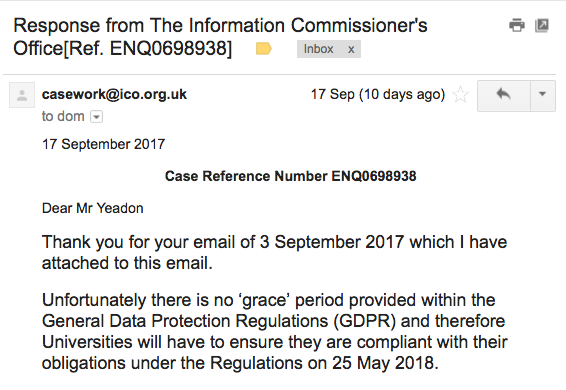 In the past 4 months I have spoken (confidentially) with so many UK universities about the issues they are facing with building GDPR into their student recruitment processes. Data protection controls - how can our Data Protection Officer and their team all benefit from more robust GDPR controls, processes and stored communications evidence? Stored evidence - how can we rely upon a detailed audit trail stored against each student to support fast CMA and GDPR issue resolution? Safe marketing communications - how can we continue to send out our recruitment campaigns after 25 May 2018? Getting consent - how should we get, store and update appropriate consent throughout the student journey? Dealing with the new rights - how do we handle every single data subject right exercised without a huge new team of experts on hand? "how can we continue to send out our recruitment campaigns after 25 May 2018?" I explain how they can empower their marketing and recruitment teams to continue sending creative mar-comms from within a safe framework. To prevent what I call 'cautious recoil' (where marketers freeze in the headlights, preferring to do nothing rather than do something that might be or go wrong) their university must remove any inhibitions. And then I show them why students trust the universities who use our UK-based solution - Student CRM. At the time of publication of this post, Student CRM is still the only HE student recruitment solution to have built and launched its GDPR and CMA compliance services. It is built into every web form that collects data (in) and into every automatic touchpoint and campaign that sends consent compliant comms (out). Unfortunately there is no ‘grace’ period provided within the General Data Protection Regulations (GDPR) and therefore Universities will have to ensure they are compliant with their obligations under the Regulations on 25 May 2018. We are now getting approached regularly by UK Universities who need to understand how to implement GDPR controls to cover their student recruitment activities. We provide the UK's only CMA and GDPR fully compliant student recruitment platform - www.student-crm.co.uk. Our clients automatically benefit from this upgrade, as it is just one of the 25 upgrades we roll out every year. We are happy to talk you through how we can help you to achieve CMA and GDPR compliance with robust controls built-in.